We've watched a lot of movies lately; the end of December and the very beginning of January are times for relaxing the homeschooling work and recharging our batteries. We are a no-TV family and we don't have video/computer games, so our downtime often consists of viewing films. The girls and I love to watch a good movie; a great film is a work of art. Alex and Sage have wanted to watch Disney's Cinderella and Disney's Sleeping Beauty back-to-back for months. I was confused about this request until Alex finally explained it to me a couple of weeks ago. Turns out the voice of Cinderella's stepmother and the voice of Sleeping Beauty's evil fairy belong to the same actress, the late, great Eleanor Audley. The girls picked up on the similarity of the characters' voices after watching the two movies months apart. They've since wanted to watch the two movies back-to-back -- they thought it would be fun to hear Cinderella's stepmother suddenly jump into Sleeping Beauty. 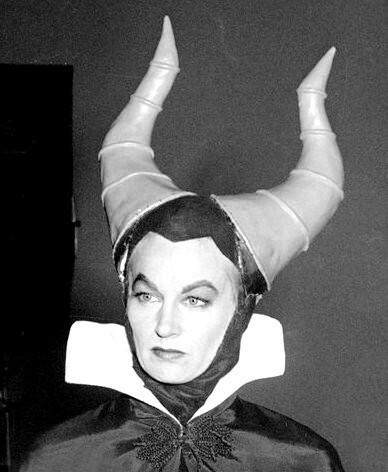 Eleanor Audley in costume concept for the role of Maleficent in Sleeping Beauty﻿ (1959). It was very entertaining -- and a bit odd -- to hear Audley's voice first in one movie, and then immediately in another. It was as though the stepmother had gone to sleep one night and awoken the next morning in a different film. We kept expecting Cinderella to appear in the background of King Stefan's castle, perhaps mopping the floors or dusting Queen Leah's throne. We enjoyed ourselves. We hadn't seen either movie in quite some time, as the girls are swiftly moving on to films with more adult themes and less fairy-tale qualities; it was nice to revisit these classics. A word about the anti-feminist vibes both these movies emit -- I've had many talks with my girls about the unhealthy messages of classic Disney films (physical beauty=kindness, bad=ugly, woman=helpless). Since we've spoken about such issues often, I now feel comfortable letting the girls watch and enjoy these movies for their better qualities -- namely, the voice-overs, music, and animation itself. These are gorgeous films with fine acting by the voice-over artists. The hand-drawn animation is nothing short of stunning. There's a lot to appreciate here, as long as kids understand that the movies' females represent bad role models. On the next Thursday Things: we donate some quarters to other people's meters and play Delayed Secret Santa to five New Hampshire houses.